Prostage stands for professional stage equipment. The various units are to be regarded as an associated system that differs in some important points from standard MIDI foot controllers and loopers. 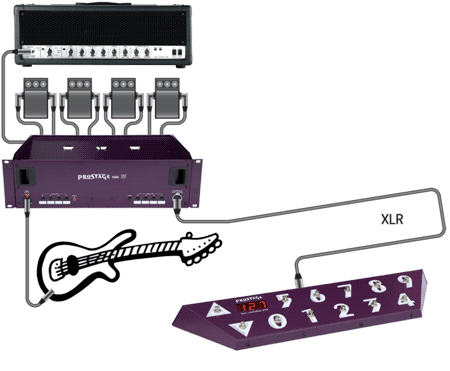 In a Prostage guitar rig, the signal is completely processed in the rack. At the front of the stage are only remote control units: MIDI foot controllers and expression pedal(s). Thanks to the Prostage Remote WahWah and the XDS Loop System, all effects that usually are fitted on a pedal board, are kept in the rack and operated remotely. This eliminates long guitar cables between the front of the stage and backline. A definite advantage for the audio quality and reliability! 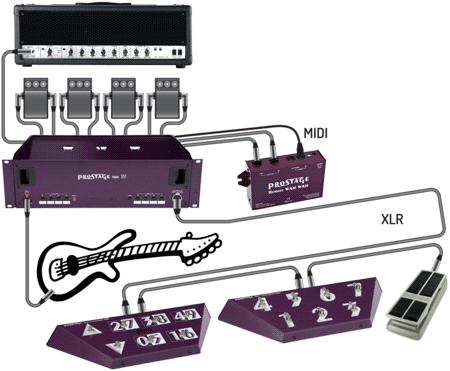 In addition, the guitar rig can be controlled with multiple foot controllers from different points of the stage. Step on a single button and recall not only the presets of your effect devices, but also switch amp channels and stompboxes! Your live-performance will no longer be interrupted by tap-dancing on several devices. You control everything with only one foot controller, which is connected to your effect rack by a standard microphone cable! 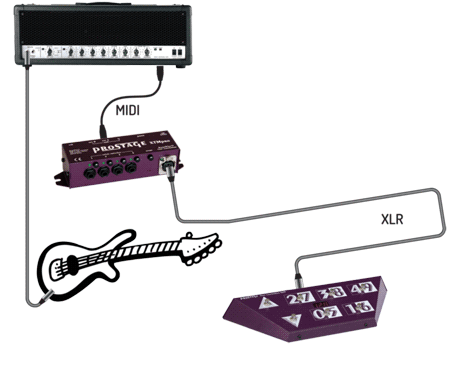 The StageWire technology developed by Prostage thereby achieves a secure connection between foot controller(s) and guitar rig / amp. Real time effects are controlled by expression pedals or by using the tap switch. Programming of all Prostage units is easily done using the clearly laid out System Manager software for Mac or PC. The well thought-out, practical concept guarantees perfect live operation. With Prostage, everything is under control no matter what you are controlling, be it megaracks, modelling amps, tube amps, effect processors or stompboxes. Flexible. User-friendly. Sturdy. Reliable. Road-proof. 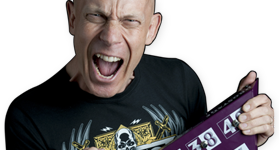 Recall presets, switch stompboxes and amp channels simultaneously with the tip of your toe.